Extend KY 3076 (Mineola Pike) approximately 1.15 miles from KY 1017 (Aero Parkway) to South Airfield Drive. Install multi-use path improvements in conjunction with the CVG Loop Trail. Mobility in northeastern Boone County will be improved by providing a direct connection to I-275 from KY 1070 and the Cincinnati/Northern Kentucky International Airport (CVG). 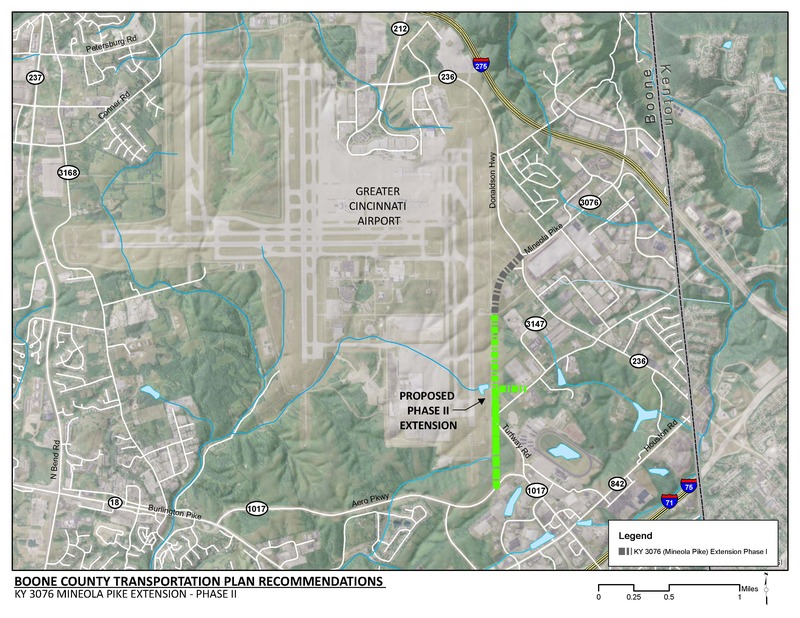 The new roadway will improve existing congestion, as well as support traffic generated from future expansion of development within and east of CVG. This project will resolve the safety issue associated with the 90 degree turn in the existing KY 717 (Turfway Road). The multi-use trail included in this project will provide a portion of the CVG Loop Trail. This recommendation is consistent with Boone County’s overall goal of improved bicycle and pedestrian safety and connectivity. Click HERE for a map of multi-use paths in Boone County. Industrial development within and around CVG is occurring rapidly. The construction schedule of this project will be essential to reduce congestion related impacts to businesses in this area. Additional right-of-way will be needed to construct improvements at the interchange. This project will require coordination with CVG to determine final alignment. KY 3076 (Mineola Pike) serves as a primary connecting route between I-275, the South Airfield Drive entrance to the CVG, KY 236, and industrial development east of the airport. Freight distribution activities at CVG is expected to grow dramatically which will increase the volume of traffic that uses South Airfield Drive and the need for a more direct connection between KY 1017, KY 236, and KY 3076. As development continues expands in and around CVG, it is essential to provide reliable mobility to serve these facilities. The KY 3076 interchange serves a mix of industrial, business park and commercial development. This type of development is expected to expand by the year 2040. Distribution related development is planned at CVG which is expected to add at minimum 2,700 jobs to the project area. In addition to the development planned at CVG, employment within the project area is expected to grow by over 1,000 jobs. There are no dedicated bicycle or pedestrian facilities along the existing KY 3076. However, multi-use paths are included in adjacent recommendations such as KY 3076 Extension Phase 1, KY 236 (Donaldson Highway) Widening, KY 3076 Widening, and the I-275 interchange reconstruction at KY 3076. There is an existing multi-use path along KY 1017 (Aero Parkway) which serves as the initial piece of the CVG Loop Trail. TANK fixed route 2X serves CVG and the development to the east of the airport. Existing KY 3076 is part of this route.